Classic Bars | Classic Bars, Inc.
At Classic Bars, Inc., we tailor home bar designs to match your personal style. Our classic style home bars provide long-lasting worth with high-quality material shaped into traditional patterns. Classic bars have an elegant style that exemplifies class and stands the test of time. Speak with our consultants about the features that best fit your needs and style. We can incorporate custom key features you want into your home bar. Our team wants you to have everything you need and can add modern conveniences to classic styles. Your personal bar can include appliances like sinks and refrigerators so your material is centrally located. 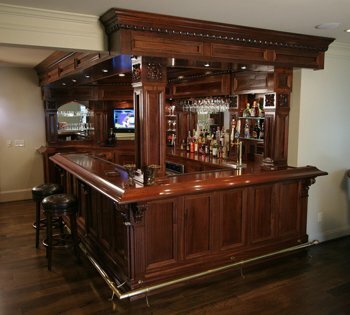 Call (404) 350-9806 and speak with us about building your custom home bar that you will enjoy for years to come.